LFG traveled to St. Anthony's High School in Huntington, N.Y. for the inaugural New York 7-on-7 Championship on Saturday, July 17. More than 200 athletes from 11 schools participated in the event and helped to raise more than $10,000. 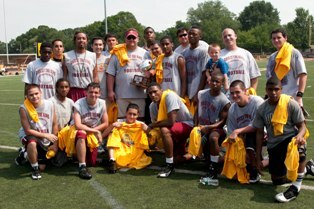 Christ the King captured the 7-on-7 championship and Cheshire Academy placed second. Special thanks to Farrell Fritz, P.C.- Hempstead, N.Y. and Frank and Holly Santoro for sponsoring five teams as well as underwriting expenses for the event.